Yesterday, I went for some driving adventures around Southern Ontario with my friend Dee, who needed to drive off to take her son to and from day camp outside of town anyhow. So, we made very good use of the intervening hours and decided to investigate some yarnly locations and to see what we could see. 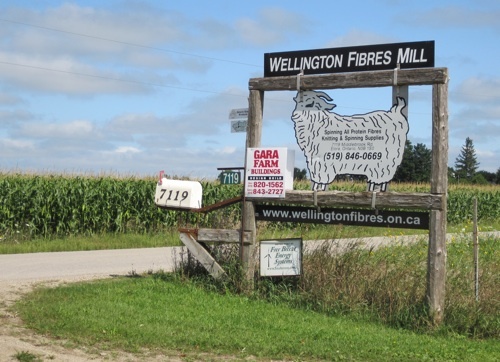 There are a lot of spots to choose from in this province, and so much to knit with. Wellington Fibers was our main destination, as it took the longest to get to. Dee is developing interest in mohair blends and glove/mitten knitting, and I had an itch to supplement the skein of their 2-ply mohair/wool laceweight I bought back at the Knitter’s Frolic in April, so we were both happy to make the trip. It was well worth it. When we arrived, co-proprietor Lorne and his sociable dog were the only ones in the store, and he was happy to let us browse at our leisure. Then, after a few minutes, he asked us “would you like to see how the yarn is made?” and we thought about that for about two and a half seconds and said “SURE!” So, we were duly treated to a tour of their mill works, where they spin not just their own wool but also process orders for other wool suppliers in the area. It was great fun. 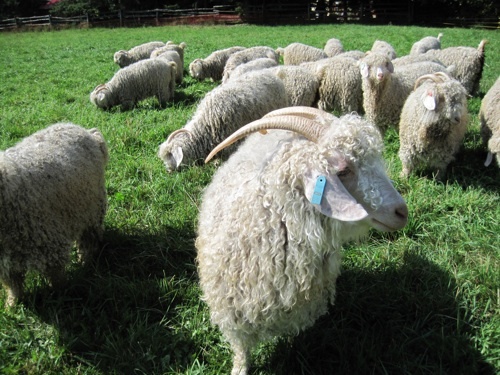 They raise their own angora goats and use their locks for the mohair blends of yarn as well as spinning fibre, and buy the wool locally from sheep farmers. He explained about their process of washing and preparing the fibres with natural, less harsh treatments than larger scale operations use. Their yarns really are beautiful. We each came away with a few skeins (I did indeed, supplement the laceweight, and hope to bring this out into use soon once my current shawl WIP is off the needles), and I’m sure they are not the last. They are regular vendors at the Kitchener-Waterloo Knitter’s Fair (in September!) 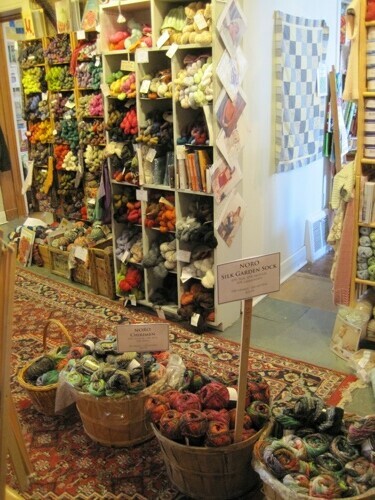 and the Toronto Knitter’s Frolic (in April), and are definitely worth a look. 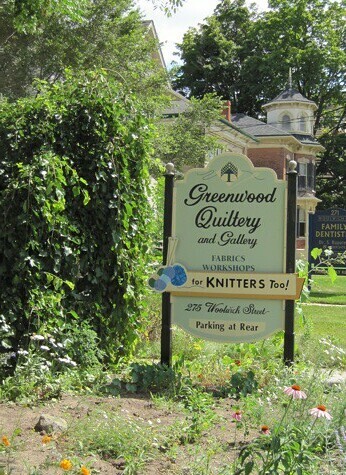 After lunch in Guelph we went off in search of another stop new to both of us, Greenwood Quiltery. Dee had located this one through searching for local yarn shops Ravelry, which, I have to admit, I didn’t even know was possible on Ravelry. (I need to brush up on new features). They are, as the name suggests, a Quilting shop, and their main wares are in fabrics and quilting supplies, and they host a gallery space on the upper floor of the building. We talked a bit with the owner (whose name I sadly neglected to find out), who was friendly to talk to and who explained that the store’s focus will always be quilting, but she has been enjoying developing the knitting room as a part of it. Sure enough, tucked away in the back of the house is a small room lined on all sides with yarn, needles, notions, and books. 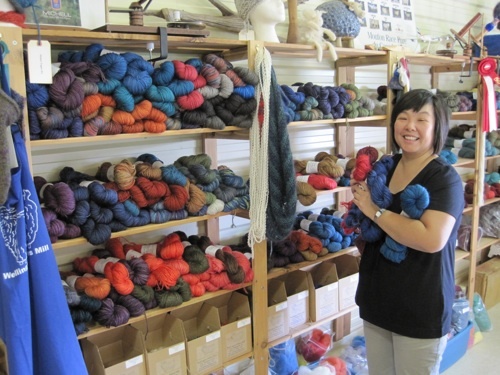 They carry enough Koigu to make Koigu-lovers happy for days, I can report, but also a steady supply of labels like Fleece Artist, Blue Sky Alpacas, and Malabrigo. It was a very pleasant stop to browse in and I admit that I may have rescued a lone skein of lilac Berocco Ultra Alpaca (had to be done) and a skein of Malabrigo Silky Wool. Although both of us are starting to get antsy about work lives resuming in higher pace, Dee did say quite wisely that there will be a time soon enough when we will long to have days like this, and lo, I am glad we did it. It shall have to be repeated again in the future. Have you had a local yarn visiting day lately? Until next time, keep the knitting close by! Sounds like a fabulously fun day! Looks like the weather was great too! Sounds fun! Can’t wait to see the laceweight. How cool that you got to see the inner workings of the yarn facility! *envyenvyenvy* I love seeing how things work. what a lovely pre-semester adventure! Awwww look at those lovely curly goats!